RIAA certified for over five million units sold, SCARECROW debuted at #1 on the Billboard Top 200 and Country Albums charts with first week sales of 465,523. This marked the 7th time Garth debuted at #1 on the Top 200 chart (more times than any other artist) and the 9th time to debut atop the Country Albums chart. It was the biggest selling debut week for a country album since the release of Double Live in 1998. 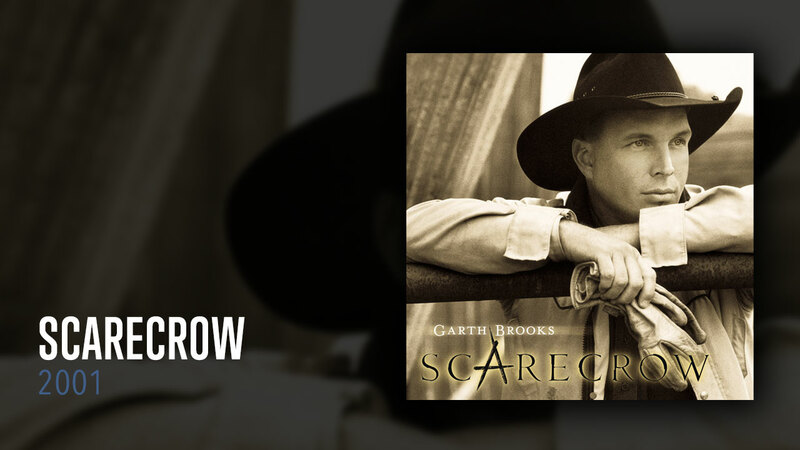 SCARECROW was released one year after Garth announced his impending retirement. From “Beer Run,” the fun-loving duet with George Jones, to the hauntingly beautiful, Golden Globe nominated “When You Come Back to Me Again” from the movie Frequency, SCARECROW is a rich collection of songs from Brooks at a very poignant time in his life. In 2005, the world’s largest retailer approached Garth and expressed an interest in looking “inside the vault” of his previous recordings. From that relationship, “Good Ride Cowboy,” the tribute to Chris LeDoux, and the #1 hit “More Than a Memory” were added to limited release collections. In 2016, those two songs found a permanent home on SCARECROW, summing up the work of the great producer, Allen Reynolds.